On November 14th at the MGM Grand in Las Vegas, Nevada, Manny Pacquiao will face Miguel Cotto at a catch weight of 145 lbs., 2 lbs. under the welterweight limit. This fight should be an action packed slugfest from the opening bell. Pacquiao is coming off a sensational 2nd round knockout of Ricky Hatton and has won his last 10 bouts. Cotto has won his last 2 bouts after being stopped in the 11th round in a war with Antonio Margarito. Miguel Cotto must keep Pacquiao from swarming him with his whirlwind punching attack if he is to be victorious. An effective jab can neutralize Pacquiao's speed. Cotto must impose his will on Pacquiao. He needs to throw his body shots off the jab and force Pacquiao to fight backing up. Pacquiao has been stopped twice in his career from body shots and Cotto is one of the best body punchers in the sport. He cannot move toward Pacquiao without the use of a jab because he will get blitzed with punches. If Cotto does not dictate this fight with his jab, he will not defeat Pacquiao. Will Cotto be able to use his size advantage effectively or will he be too drained making the 145 lb. weight limit when he is used to making 147 lbs? This depends on how in shape he is now, when he starts training and how close he keeps his weight to the 145 lb. limit during training without dehydrating himself. There may not be a weight issue for Cotto like many people believe. Cotto has fought bigger, stronger and harder punching fighters than Pacquiao has in his career. Cotto started his professional career at 135 lbs., and as his record indicates, has done well suffering only one defeat and knocking out 77% of his opponents. In contrast, Manny Pacquiao started his career at 108 lbs. and has a knockout percentage of 69%. Cotto has shown that he can take a punch pretty well from bigger punchers. Can Manny hurt him? No matter how good a fighter is, if he keeps getting blistered with punches, he will falter. Has Cotto ever been in the ring with someone so quick? Probably not, and this is another important factor in determining the outcome of the fight. Manny Pacquiao is a whirlwind puncher and lands his shots from all angles with lightning speed. Pacquiao moves in and out quickly and uses his jab as a range finder. Sometimes, he can be a little off balanced after he fires a combination, but Pacquiao's trainer Freddie Roach has drastically helped him improve his footwork. Pacquiao is elusive and boxes better now than earlier in his career. Manny possesses good head movement and keeps fighters a little hesistant from throwing their shots, which enables him to land clean, effective punches. Cotto is slower, at times flat footed and looks to counter punch. It's hard to counter punch if you don't match your opponent's hand speed. That leaves Cotto with one option. His timing placing his punches must be perfect because Manny has the definitive edge in hand speed. Pacquiao must make Cotto fight at a very fast pace. 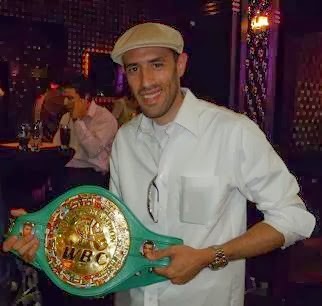 He needs to make Cotto use a lot of energy, especially with Cotto having to make the 145 lb. weight limit because he might be drained and tired if the fight gets into the later rounds. Pacquiao should not have a problem being dehydrated because he is the smaller man moving up in weight. Pacquiao needs to use his speed advantage against Cotto because he does not want to stand there and trade shots with the bigger puncher. If this fight gets into the later rounds and Cotto is not dehydrated from making the 145 lb. weight limit, than he will have an advantage over Pacquiao. If Cotto presses forward at his pace and Pacquiao exerts more energy than he wants, than the advantage goes to the bigger man. Pacquiao looked tired in his two fights with Juan Manuel Marquez in the later rounds. Cotto probably will put more pressure on Pacquiao than Marquez did. However, Cotto is unlikely to counter punch Pacquiao as effectively as Marquez was able to do in both of their bouts. Marquez matches Pacquiao's hand speed better than Cotto because he is a more efficient counter puncher. Pacquiao comes into this fight extremely confident riding a 10 fight win streak. Cotto still looks like he doubts his abilities after losing to Antonio Margarito. In his last two fights, when Cotto has taken a clean punch, his body language suggests that he is having flashbacks to the war he fought with Margarito. He looks like he is re-evaluating the situation about whether he wants to engage. This showed more in Cotto's fight with Joshua Clottey than against Michael Jennings. However, Cotto came out victorious in both contests and hurt Clottey in the 6th round. In the later rounds against Clottey, as opposed to the Margarito fight, Cotto was resilient and fought back well enough to come away with a 12 round split decision victory. Now, this leaves the question: Is Cotto's confidence restored after coming away with the victory over Clottey? Will shades over the Margarito fight be a lingering cloud over Cotto? How will he react when Pacquiao lands a clean, effective punch? We'll see on November 14th, but Cotto does possess the punching power to take away Pacquiao's confidence with one punch. This will be the hardest puncher Pacquiao has ever faced. Being a southpaw, Manny Pacquiao presents a problem to Miguel Cotto. There are other factors stated above as how Pacquiao has some advantages too, but fighting from that stance may be too tough for Cotto to handle. The awkward angles Pacquiao throws his punches, along with his speed and balance, may keep Cotto off balanced all night and he may never get close to landing an effective punch. Boxing's oldest saying is "Styles Make Fights". Boxing's next oldest slogan may be that "A good big man, will beat a good small man". I think the latter statement will come to be true on November 14th. HOW I SEE THIS FIGHT PLAYING OUT? In the early going, Miguel Cotto will press forward and Manny Pacquiao will box. Pacquiao will land many of his quick punches in combination, but Cotto will be resilient. Cotto will continue to impose his will on the smaller man. 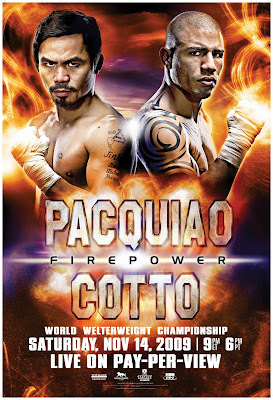 Pacquiao will exert a lot of energy boxing him and as a result, Cotto will get closer and land effective shots. In the middle rounds, I see Cotto and Pacquiao exchanging quality punches with Cotto landing the harder shots. Sorry Pacquiao fans, but I see Cotto stopping Pacquiao with a left hook to the body in the 8th round. Cotto is really huge killing mashine! Pacquiao has no chances. I see Freddie throwing in the towel in the 10th. I feel the same way, early is when Pacquiao is dangerous, but Cotto will fight him off and stop him late. I'm going with Cotto Mike!